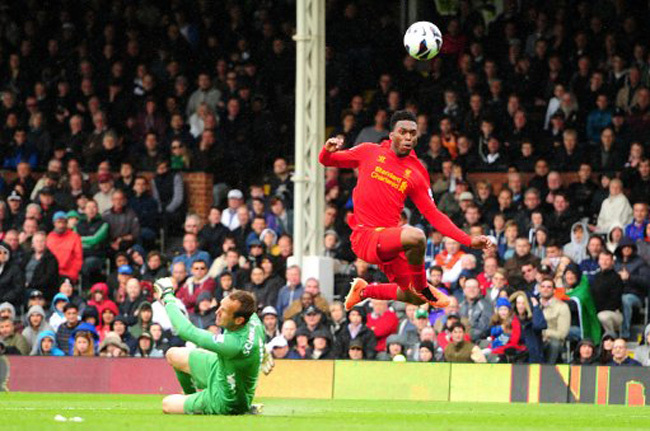 Daniel Sturridge became the fastest Liverpool player to 10 goals in Premier League history after netting a fine hat-trick at Craven Cottage on Sunday. Dimitar Berbatov may have opened the scoring, but the Reds dominated for large periods of the game with Sturridge and the superb Philippe Coutinho running rings around the Whites’ backline. Who needs Luis Suarez?! What a pass for that third goal! Sturridge will most likely get a call up to the Three Lions soon. Hopefully it’s at the expense of that awful Welbeck. As you say, Alan, who needs Suarez? My wife was well pleased. Me, as a United supporter, was impressed by this up-and-coming young team. Coutinho in particular was fantastic. I think Liverpool will be lucky to hold on to him. l love that three boys ‘sturridge, coutinho and suarez’. Well play and well done to all liverpool players. Continue the good job. Coutinho really is something else. If the arse-end of this season is anything to go by, we should be up there next season. By which I mean “above seventh”.